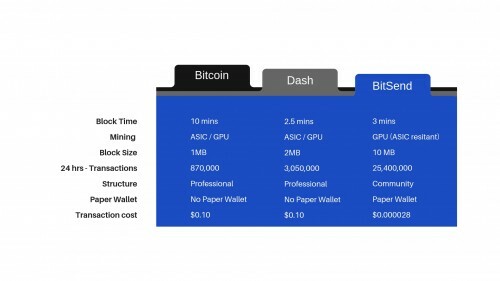 Bitsend is an established masternode crypto currency, designed as a "Transaction medium for day to day transactions"
Looking at a structural comparison between BTC, Dash, and BitSend; the obvious strengths include a capability of high number of transactions and a low cost transaction fees. These coin properties are aligned to the needs of a coin capable of supporting day to day transactions through cryptocurrency. It also seems to me that the team also look like they have plenty of Development in the pipeline also aligning with this mission, including what looks to be a roll out on the Lightning network. Speaking with the BitSend team in a recent NY Crypto conference, there was obvious passion around the project and one of the motivating factors in undertaking the project was the desire to develop a unique distribution model of value over 30 years. With a stated goal on their white paper stating the desire to achieve a “Fair distribution over more than one generation”. ”whales", leading to less manipulation and a fair return on an investment. This fair sentiment seemed to be the underlying motivation of the team. With a strong list of exchanges that BitSend is available on, there is liquidity for a low cap coin, making it an additionally attractive investment and trading vehicle too. (For list of exchanges see below). In evaluating the fundamentals of the project I have been very impressed with the groundwork of this solid coin, BSD has all the foundations to rival some of the biggest players in crypto, as a currency of choice - for everyday transactions. The next step in the projects evolution would be to establish strong partnerships and agreements for high volume transactions. I am excited to watch and see what direction the team move in regards to utility. Whatever unfolds, I feel they have the foundation to achieve something special. If you wanted to check out the project in more detail here is some collated information.